After nearly two years of posting Clutter Comedy entries every Sunday about getting rid of useless stuff in and around my house, most of it is gone, and I’ve decided that my blog needs some fresh new energy. So I am starting another weekly series instead—Good Things, featuring the many unexpected joyful things that show up when clutter and stagnation have been cleared away. I recently ordered new running shoes online when I noticed that my old pair was getting worn out. The new shoes came in pretty spring colors—purple, with a bit of green around the ankles, and with laces in a lighter shade of purple. They felt comfortable when I jogged around the block in my neighborhood a few times. 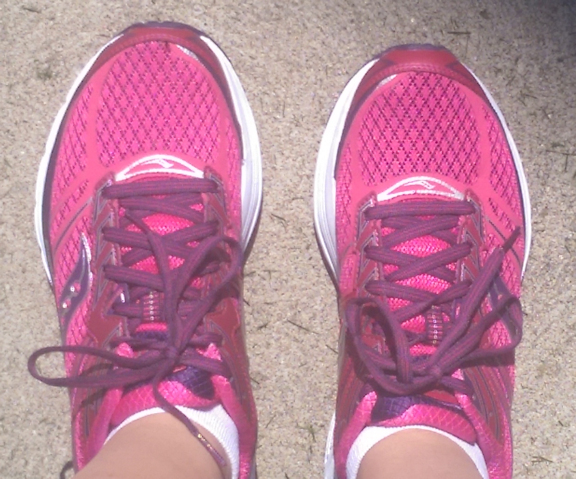 I realized they weren’t what I needed, though, when I ran five miles in the park and my feet ached afterwards. The new shoes didn’t have quite the right amount of arch support for me. I bought another pair of running shoes—hot pink, this time—in another brand I’d worn before, which felt much better. 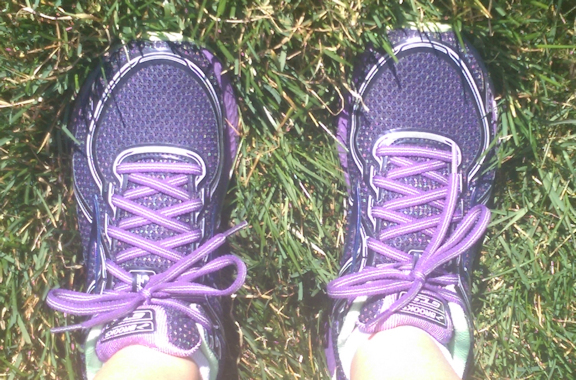 In past years, if I had bought running shoes that weren’t right for me, I’d have felt irritated about it. And if I had decided to keep them for walking, they would’ve been just another not-really-wanted thing with annoying memories and negative energy. But this year, after I had liberated my house from old shoe clutter (as seen in this post), I felt cheerful about keeping the purple shoes for walking. They brightened up the closet and looked good when I wore them with spring clothes. Besides, there’s certainly no reason why I can’t have two pairs of new and pretty athletic shoes at the same time! Love the pink ones, the colour is great and they seem comfortable. Shoes are the most important wardrobe item for me, if they are not right and comfortable they can destroy our day and our body. Good choices, and of course you can have more than one pair of pretty shoes.